As explained in this study, here’s another trick for reducing both the patient radiation dose and the patient iodine dose in cardiac CTA: lower the kVp to 100 or 80 or even lower. Of course, you can accomplish this same outcome by using dual energy CT and viewing the vessels with lower keV or kVp while viewing everything else at higher energies. We already know that low-dose CT is a valuable tool for reducing mortality rates, but now there’s evidence that it might reduce financial costs as well. 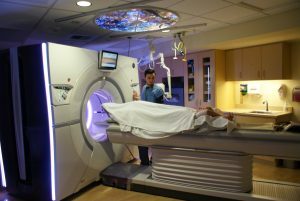 A new analysis of the 2010 National Lung Screening Trial (NLST) shows that low-dose CT is a cost-effective diagnostic tool for patients at high-risk of lung cancer, according to AuntMinnie.com. In my opinion, though, the key question in whether low-dose screening for lung cancer is cost effective is: what is the cost of working up the false positives? That cost needs to be subtracted from the cost benefit of the lives saved. This new analysis suggests that low-dose screening is indeed cost effective. One thing no cost analysis considers: the value of a negative exam to a very worried patient. Further new twist: we now can do ultra-low-dose lung cancer screening using fully model-based iterative reconstruction techniques. This technique enables a 60 percent radiation dose reduction (down to the sub-0.5 mSv range) below that of even recent low-dose CT – further substantially decreasing any downside from lung cancer screening in high-risk patients. 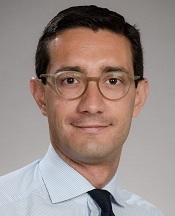 The following is an interview I conducted with Dr. Lee Mitsumori, Assistant Professor of Radiology at the University of Washington. Dr. Shuman: Please give us a brief overview of your work involving weight-based selection of CT parameters. Dr. Mitsumori: We have been investigating the use of body-size-dependent CT scan parameters to optimize the radiation dose of each scan. Several imaging parameters can be modified at the time of the CT that can alter the amount of radiation of the scan (tube current, tube potential, scan range, scan phases, image reconstruction techniques). The challenge is to adjust each so that the final set of patient images are of diagnostic image quality and were obtained with the lowest possible radiation dose. The risk is that incorrect settings or too aggressive dose reduction can create a scan that is of poor image quality that does not allow a correct interpretation. Current work at University of Washington Medical Center involves studies comparing different CT image reconstruction techniques (adaptive iterative reconstruction, model based iterative reconstruction) that can significantly reduce CT image noise and how these can be best implemented in patient CT exams. Dr. Shuman: Why is weight an important concern regarding CT? How does weight affect CT? Dr. Mitsumori: A patient’s body size, as reflected by weight, affects two important feature of a CT scan. The first is the amount of photons needed to generate an interpretable CT image. 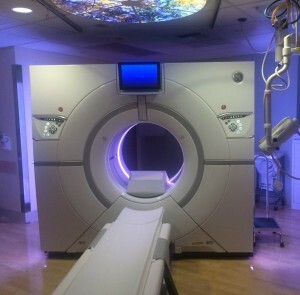 A CT is a projection technique, where an x-ray source emits photons that then pass through the subject before being recorded by a detector on the other side of the patient. Larger patients need more photons with higher energy than smaller patients to create images that can be correctly interpreted. If the CT parameters are not correctly set and only a small number of photons are recorded by the detector, the images created are noisy. If an image is too noisy, the interpreting physician may not be able to see if a problem or disease process is present. Unfortunately, the more photons used the higher the radiation exposure of the CT exam. While large patients are at risk for having noisy images, small patients can have scans done with parameters selected for an average sized patient, in which case too many photons are used than what would be needed to create diagnostic images. Thus, the importance of matching the radiation dose (number and energy of photons emitted) with the patient’s body size to prevent non-interpretable studies in larger patients, and avoid excessive radiation dose in the smaller patient. The second feature of a CT scan where patient size is important is in the amount of iodinated contrast needed for the scan. Iodinated CT contrast is injected intravenously during the scan and improves the depiction of the different organs and vascular structures in the body. With CT imaging, the use of contrast greatly improves the radiologist’s ability to differentiate diseased (tumors, infection, inflammation) from normal tissues. Similar to radiation dose, the amount of contrast needed to enhance the organs is dependent upon patient body size. Small patients will have smaller organs, less blood volume, and be shorter than larger patients. 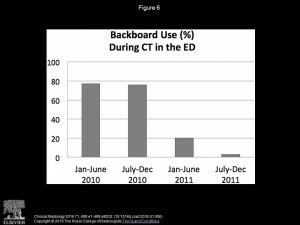 Thus the amount of CT contrast needed may not be the same for every patient. Dr. Shuman: What are the risks involved when a hospital or imaging center does NOT take a patient’s weight into account? Dr. Mitsumori: The risks for scanning with fixed CT parameters are that when compared to an average sized patient, the large patient may have scans with noisy CT images that could lead to interpretation errors, or a non-diagnostic scan in which the scan may need to be repeated or an alternative imaging test performed. For the smaller patient, the risk would be that more radiation is used than what is needed to generate adequate, diagnostic images. Similar risks occur with CT contrast administration. If a fixed amount of contrast is used for every scan that is based on an “average” patient size, then large patients may not receive enough contrast to adequately enhance the internal organs rendering the scan potentially non-diagnostic, and the small patients are given more than the amount of contrast needed to obtain an adequate scan. Dr. Shuman: When discussing CT exams with their doctors, are there questions a patient should ask regarding their weight? In other words, what would make an “informed patient” as it relates to weight and CT? Dr. Mitsumori: An informed patient would want to ask if their CT scans will be performed with “patient tailored” or “patient specific” protocols that use the amount of radiation and iodinated contrast that best match the patient’s body size. I am often asked what, exactly, iterative reconstruction is – and why it is so important. I thought it would be a good idea to discuss what I do and what my work means for the University of Washington Medical Center and our patients. Iterative reconstruction to us means potentially significant radiation dose reduction to our patients, but the look of the CT image itself needs some getting used to. When we first got the option on our scanners, we wanted to make sure that our radiologists would be comfortable with the images produced. So, based on our protocols at the time, we reconstructed them with varying percentages of iterative reconstruction and noise indexes, and had our radiologists evaluate the images and decide what they found to be the most similar in noise and image quality to our standard at the time. They used a double-blind method to evaluate the images, and based on what they decided, for noise index and iterative reconstruction percentage we were able to reduce radiation dose to our patients by 40-60 percent. We are constantly striving for improvement in image quality and dose reduction – both of which lead to better patient care. So we look again at our existing protocols and evaluate how we can combine certain series or opt for higher noise indexes in order to reduce dose. We also introduce different percentages of the iterative reconstruction and display these for our radiologists to further evaluate. Our radiologists are always willing to go out of their comfort zone in order to reduce dose. I say this again because of their willingness to take the time to look at images that traditionally would not be pleasing to their eyes, but may be more than adequate for answering the questions that the ordering physicians need. 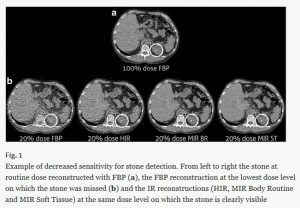 And, again, a prime example of that is the different percentages of iterative reconstructions that they’ve seen and continue to look at, in order to properly evaluate the balance of dose vs. image quality – and always striving to improve both. We always put patients first. To do this, we need to make sure that we give the right amount of radiation dose. With the modern machines we have, it is far too easy to give too much dose to produce the prettiest of images, but easy is not safe. To use these modern machines properly and responsibly takes a lot of extra work to accurately and safely fine tune each protocol for each patient’s needs. Our patients deserve all of that extra effort and more. 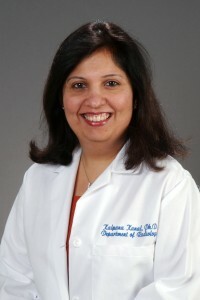 Recent findings from blog contributor Dr. Kalpana Kanal and her team of University of Washington researchers have been published in the April issue of the Journal of the American College of Radiology! 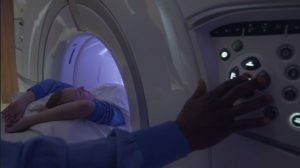 The purpose of the study was to examine the variation in pediatric trauma head CT imaging protocols in Washington State – including the use (or not) of low radiation dose CT. Based on their findings, the team is now working on a campaign to adopt CT dose reduction protocols throughout the state. For more information on the study, click here. Great work by Kalpana and her team! Year’s Biggest Advancement in CT Technology? I would agree with Dr. Siegel that iterative reconstruction has stimulated thinking and conversation among radiologists about how to substantially lower CT dose without compromising the benefits of CT. Based on our 18 months of experience, we know the reduction is at least 40 percent with the current version of iterative reconstruction. And we suspect much greater reductions are coming. Some of the issues centers around radiologists’ “preferences” for how a CT images looks. But preferences can change, even dramatically, when driven by the hope of much lower patient dose. What do you think – what do you view as the biggest advancement in CT? In the days that followed last month’s Low Dose CT Symposium, I had time to reflect on how wonderful it was that the event drew an unprecedented number of attendees. The interest in the symposium was evident by how far some attendees traveled to get there. I was also struck by the segments of the industry that were represented in the audience: technologists, radiologists, technicians and administrators were all there. It made me think about each segment’s relationship to one another, and their ability to impact change in the industry. When driving toward much lower radiation dose in CT, it’s good to remember that a team effort is needed. Technologists must be educated on all the tricks and skills needed and must fully understand why dose reduction is important. They can help radiologists be more conscious of dose exactly when radiologists are urging technologists to pay close attention. Both techs and radiologists can use their knowledge to help educate administrators about the importance of investing in low dose CT. Everyone can help educate referring clinicians about thinking of dose when they order, both for an individual study and cumulative dose (over time) in individual patients. And it is the whole chain of providers who monitor appropriateness of studies at each and every level. Proper dose reduction is not just about having the right equipment. It is essential that everyone is involved, and that they all work as a cohesive team in the name of patient safety. Management supports us by making sure that the right machines, maintenance contracts and people are in place. Our radiologists ultimately determine the level of noise we allow in images, and that dictates the steps we take to reduce dose. As technologists, we have to have the right workflow in place to make sure that all those steps for dose reduction are done, such as adjusting kV, ma, noise index, and proper shielding. Our support staff assists with the busy work that can take away from the focus on the scan at hand, and the physics teams keep our QA/QC protocols in check. We are very fortunate here at the University of Washington to have all these things in place and know that as equipment and scanning techniques continue to evolve, we are able to ensure the highest level of image quality while maintaining proper dose reduction practices.